Found: possibly the perfect little tractor for Raymond and the Manse! As many of you will know from first-hand experience, spring seemed today to have, at last, arrived. As I drove home to Queensborough from work late this afternoon the sun was shining, the snow was melting, and the Corolla’s external thermometer was registering 13 degrees. (That’s about 55 in Fahrenheit, for you American folks.) After the brutal, bitter winter we’ve endured, this feels kind of like paradise. But anyway, just seeing a bit of grass, yellowish and dead and muddy though it may be, gets one thinking about the summer months, when there is yard work to be done. I know I complain about yard work sometimes (like here and here), but right now, at the tail end of this obnoxious winter, I can hardly find anything more appealing to think about than being outdoors under the warm sun raking up leftover winter debris from the grass, or planting herbs, or weeding the flower garden. Now, as I’ve written before, we have a fairly spacious lawn – which means there’s quite a bit of maintenance to be done. Our neighbour John does a great job of cutting the grass, but at some point maybe Raymond and I should get our act together and do it ourselves. (Or not.) And in the fall there are a lot of leaves and evergreen needles to pick up. And sometimes there are fallen branches or piles of dirt to move and – well, you get the picture. Yard puttering. My cousin Bruce has suggested (in a comment on my post here) that the best thing ever for yard puttering (and snowblowing) is a small tractor. And in fact, a while back Raymond was eyeing a used (and modified) tractor that was for sale south of Madoc, but it’s long gone. I’d kind of tucked the thought away into the back of my mind, but was reminded of it this past weekend when we came upon the extremely cute bright-red Massey Ferguson tractor that you see Raymond with atop this post. Is that not just the bee’s knees, people? We found it at the display of very well-regarded local car and farm-machinery dealership McKeown Motor Sales of Springbrook (or is that Spring Brook? 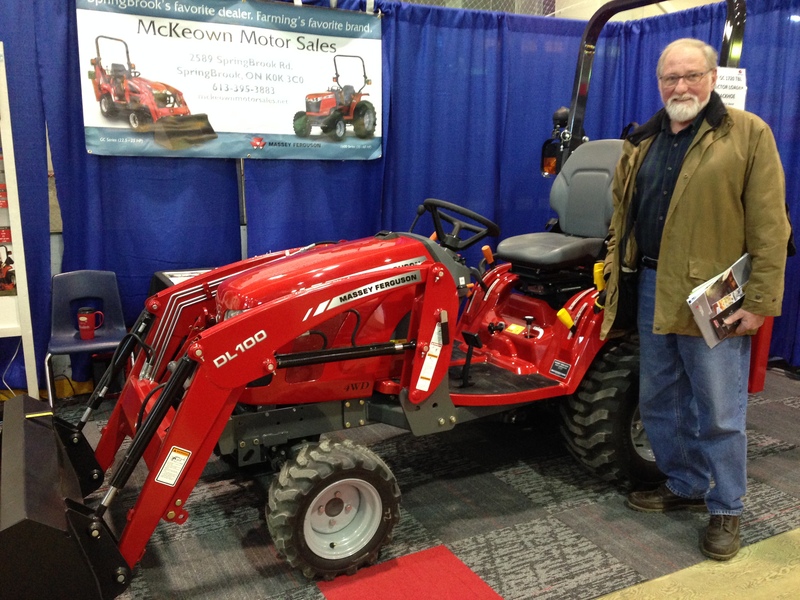 You can see my post on that topic, which references McKeown’s, here) at the Quinte Home and Lifestyle Show in Belleville. That adorable tractor had a front-end-loader bucket and a little wee backhoe; I can’t really see us needing a backhoe, but the good news is you can get it without it, and it’s (no surprise) cheaper that way. Meanwhile, you can also get other attachments, like a blade for plowing snow – and I wouldn’t be surprised if a snowblower was an option too. And you could have a trailer, and – well, just think of the possibilities! As you can see, the Manse already has some nice red accents! And on top of that, the tractor is the brightest red (my favourite colour) imaginable. 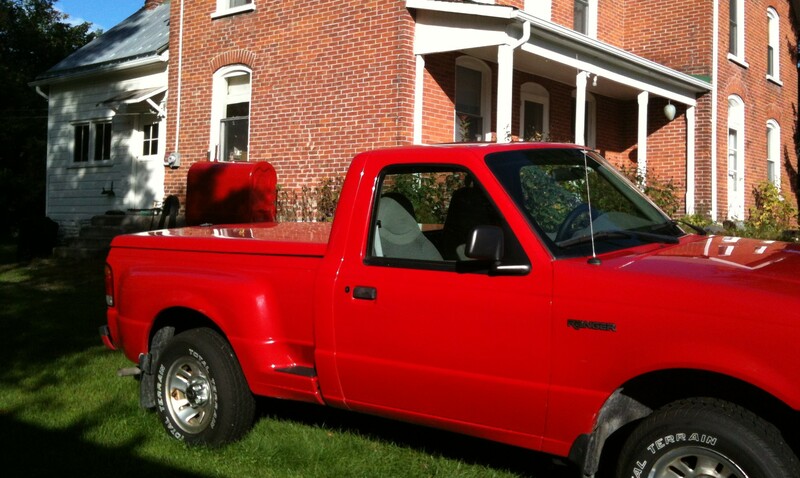 So not only would Raymond have a wonderful time putzing around on it, but it would match both his pickup truck and the Manse’s oil tank! What could possibly go wrong with this plan? Here I am to plan your social life. 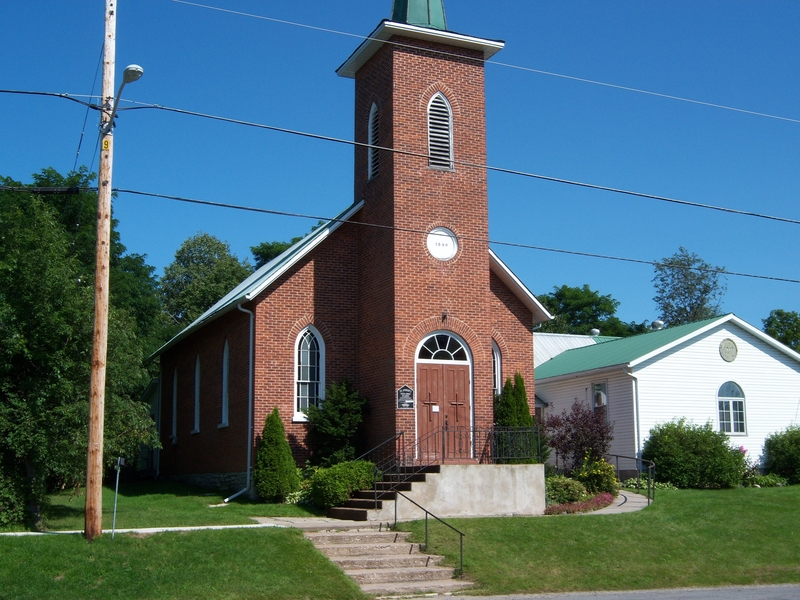 St. Andrew’s United Church in Queensborough is where you want to be for its world-famous (and world-beating) Ham Supper on Wednesday, April 9. Trust me. Folks, get out your appointment calendars. Right now. I have some good stuff to tell you about, events in the Greater Queensborough Area that you don’t want to miss. And most of them involve good eating! I’ve written before (here, in fact) about the church suppers at St. Andrew’s, which were a tradition of very long standing even way back in the long-ago days of my childhood at the Manse. In the spring there is the Ham Supper and in the fall, the Turkey Supper. At both, you will be extraordinarily well fed with some great home cooking, topped off with an astounding selection of homemade pies. And it’s not just about the food: it’s a wonderful opportunity to rub shoulders and share the news with your neighbours and friends. But if you’re a newcomer (to the community or the Ham Supper), don’t worry! You’ll be warmly welcomed, and you’ll be glad you came. 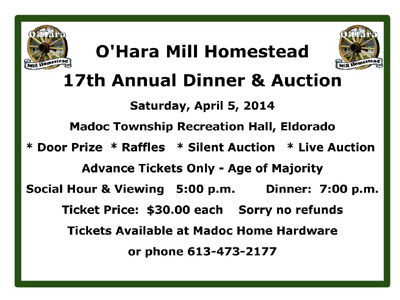 The Madoc Township Recreational Hall is at 15651 Highway 62, north of Madoc and just a bit south of the hamlet of Eldorado. As part of their well-regarded Writers Series, the Friends of the Tweed Library have invited me (of all people) to speak about blogging in general, and Meanwhile, at the Manse specifically. Yikes! But I will do my best. If you’ve ever wanted to ask a question about anything you’ve read here, or felt inclined to share your thoughts on Queensborough, blogging, central or northern Hastings County, local history, home renovations, turquoise, the Rock Acres Peace Festival, wieners and beans, Wilson’s ginger ale, maple-syrup making, Buster and Bandy, crokinole, wood stoves, Avocado Green (and the list goes on, and on, and on) – well, now’s your chance! I’d love to meet you, answer your questions, and hear your stories. Refreshments will be served! 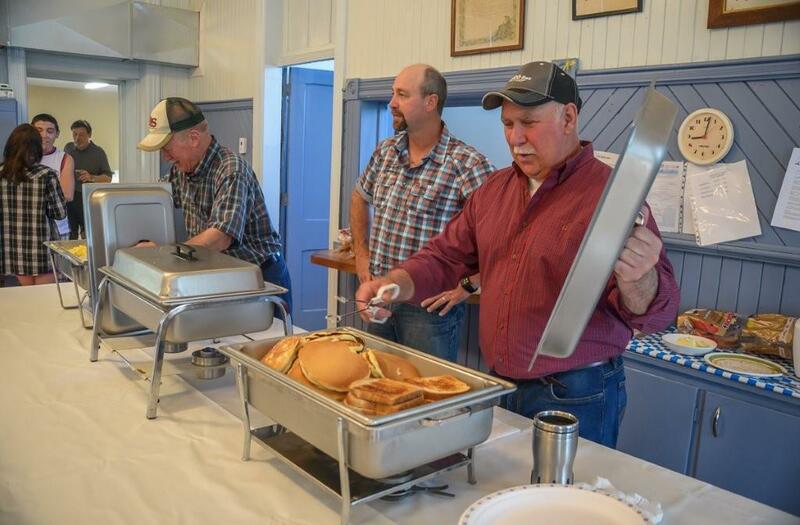 This is the time of year when lots of pancake breakfasts are on offer, but Queensborough’s is well-known as second to none. The event at our village’s historic former one-room schoolhouse, now the Queensborough Community Centre, draws big crowds every year. Like the Ham Supper at St. Andrew’s, it’s an event that combines good food with community – and newcomers are warmly welcomed! Something I look forward to every morning on my drive to work is the tail end of the 8 a.m. news/weather/traffic/sports report on Belleville radio station CJBQ (the station I grew up with here at the Manse) when morning-show host Matt Mitchell plays a song from the country-music archives. Sometimes those vintage songs are wildly obscure; sometimes they are songs that everybody knew once upon a time; sometimes they are oddities. It’s always an entertaining surprise to see what Matt will dig up. I think Boney Fingers (the song) is also what you get when you mix L.A. folk-rock, deep country roots, and a good sense of humour – which I believe (if I do say so myself) is rather a good way to describe Hoyt Axton and his music in general. I always liked the guy, and his songs. So in honour of it being Friday night, I think we should listen to another one. Here is Hoyt Axton and (did I mention L.A. folk-rock?) Linda Ronstadt with another classic that’ll take you back in time. Enjoy! To everything, even these trees, there is a season. But I am sad. 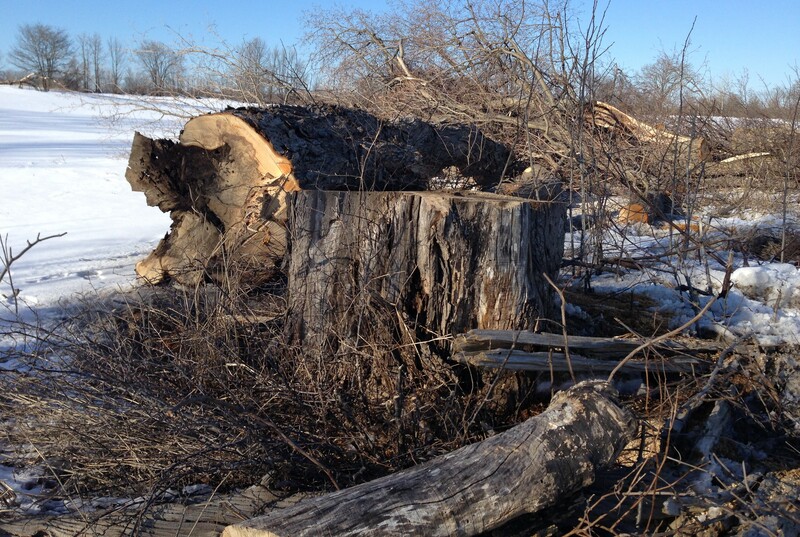 It broke my heart to see these felled trees on Queensborough Road this week. Nothing lives forever, of course – but that doesn’t mean one can’t be sad to see the trees go. For me, there is a bit of a personal connection to them: my dad used to tap them to make maple syrup in the spring. 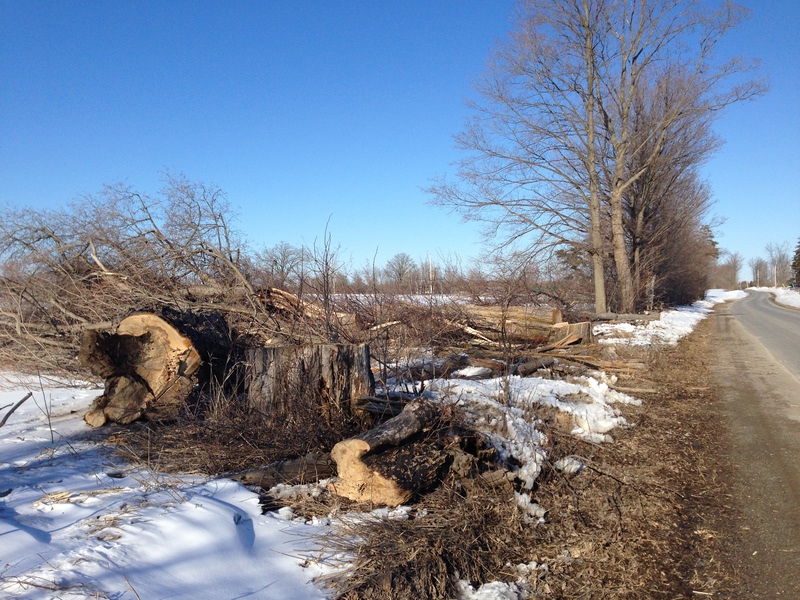 Residents of Queensborough who have had occasion to drive to “town” (Madoc) this past week will have doubtless seen that several large and venerable maple trees on the stretch of Queensborough Road just west of Cedar School Road have been cut down. I confess that when I spotted the first ones taken out, as I was coming home from work at the beginning of the week, I was so surprised that it almost didn’t register. When I saw crews at work starting to do more the next morning – and, that afternoon, the stumps that were the end result – it sank in: those trees, to which I have more than a bit of a personal attachment, were gone. Was this tree dead? I’m no expert so I can’t say. Certainly those old trees didn’t look all that great. But I’m still sad. But this is not (contrary to what you might be expecting) going to be a rant over big old trees being cut down. Since Raymond and I bought the Manse, we have often remarked (sadly) on how those old trees along Queensborough Road were not looking all that healthy. Mind you, neither of us is an arborist, and for all we knew they were healthier than they looked. But they didn’t look all that good. I figured that as (unofficial) head of the Queensborough news bureau, I had a bit of an obligation to find out what exactly was going on with the felled trees. So last night I called up Bob Sager, the reeve of Madoc Township (that’s where the trees are – or at least, were), son of the late Allan and Isabella Sager (whose long-ago wedding right here at the Manse I wrote about here), and someone who (as he confirmed to me) remembers as well as anyone that canopy of trees from long ago. Mr. Sager said that the trees in question were indeed in bad shape: dead, or soon to be. The township wants to repave the road, he said, and did not want to risk having trees fall on the roadway. And he also had some good news: that the younger, healthy trees along the stretch will be left in place. So there’ll still be maples along Queensborough Road. And they’ll get bigger, and someday (one hopes) they will be as large and beautiful as the newly cut ones were. Though unless there is a project to replant maples on the south side of the road, I guess we will never replace the canopy that so many of us remember so fondly. Or… wait a minute… Maybe there could be such a project? I may have to call up the reeve again. Is anybody else in? When I was growing up here at the Manse, my younger brother John took up hockey, and ended up the goalie for his minor-league team. My family – my dad and mum, my sister, Melanie, and my brother Ken, the youngest, turned into quite the fans, and many were the times that we all piled into the car to accompany John to a home or away game. That in turn meant many afternoons and evenings spent in freezing-cold arenas – insulation? who needs insulation? – watching the games and cheering on the team. I can still vividly remember that heart-in-mouth feeling when a player from the other side would tear out on a breakaway and little John was the only thing between him and a goal. But John wasn’t bad, and as often as not he saved the day. Thrilling times! Anyway, the other day I was given a wonderful reminder of those long-ago hockey days and nights. I was visiting with Dave and Wanda of the Hart’s-Riggs area, whose son, Michael, had played on the same team as John, and Wanda had a team photo – and she’d made me a copy! Which you can see at the top of this post. There the boys are, together again – and with my late father, The Rev. Wendell Sedgwick, in his trademark hat, in the centre of the back row. I’m not quite sure why that is, because as far as I can recall Dad was never a coach of the team, but so what? It’s just wonderful to have this photo of him. And perhaps someone can fill me in as to why he would have been in that place of honour in the photo. The list of players, as far as Wanda and Dave were able to figure out, is in the caption below the photo – and if you are able to fill in one or more of the blanks, please let me know. It would be terrific to have names for the full roster. One: Does anyone remember what the team’s name was? 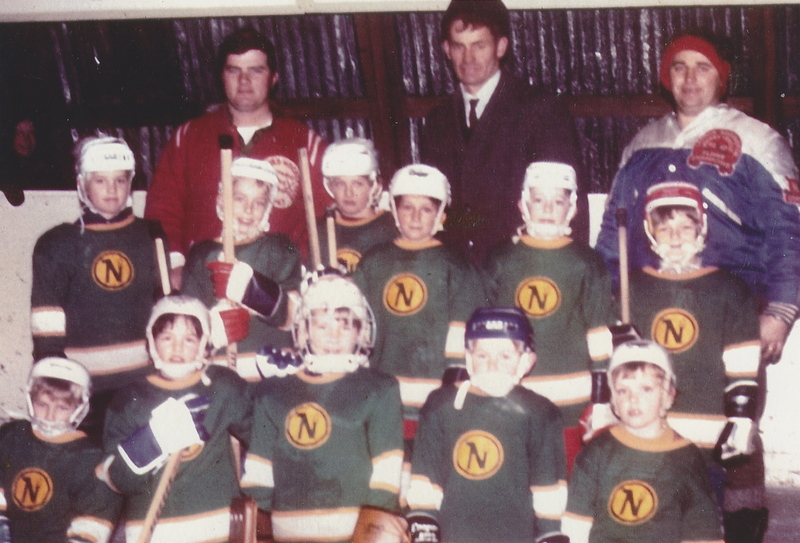 The players are wearing Minnesota North Stars-type jerseys; were they called the something-or-other North Stars? 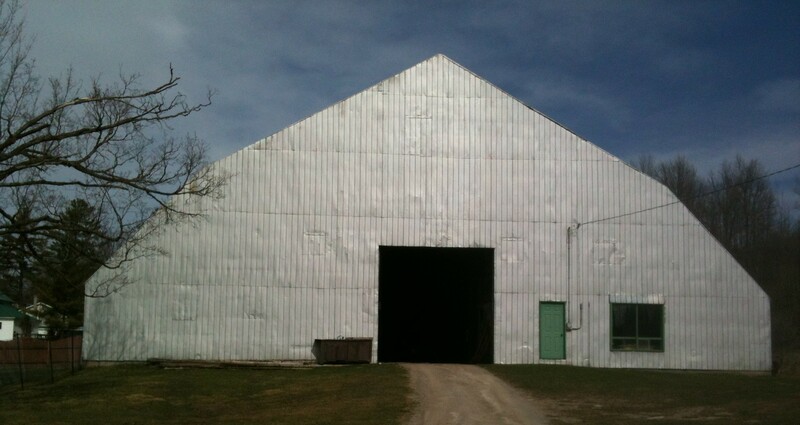 The old Cooper Arena. I just dare you to find a colder place than the inside of that building on a cold winter night. And two: Am I right that the team photo was taken at the old (but still standing – though not in use, I believe) arena in the hamlet of Cooper? Man, I remember that place as the site of some great community hockey games and skating parties. But mainly I remember it for being the coldest place on Earth. It could be 20 below outside, and inside the Cooper Arena it would be 30 below! I’m not sure how that could be, but it was. Aside from the dressing rooms, where there would be a roaring – and I mean roaring – wood fire in the cast-iron stoves, the rest of the old barn was insanely, unutterably, brutally cold. Which of course just added to the excitement and the charm of a minor-league hockey game back in those glorious, happy old days. 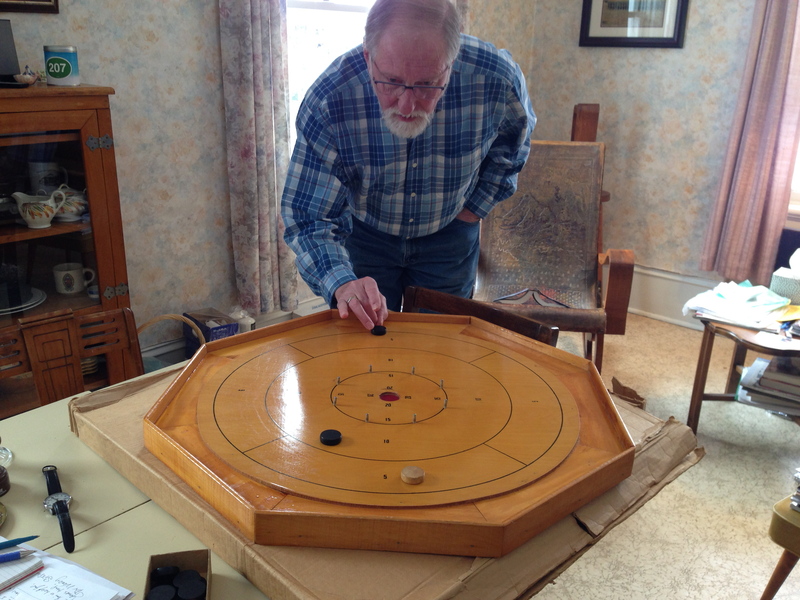 In preparation for the next Eldorado crokinole party, today I hauled out our own crokinole board – a lovely vintage one that Raymond had bought at a local auction – and attempted to explain the rules of the game to him. Here he is trying it out. Last Friday night I finally made it to the monthly community crokinole party held at the Madoc Township Recreation Centre (and firehall, and council chamber, etc.) near the hamlet of Eldorado. My friend Isabella Shaw, who I believe is the main organizer of this event, had invited Raymond and me several times, and each time we’d had a conflict with something or other. So even though Raymond was in transit between Montreal and Queensborough last Friday and I’d have to attend alone, I was determined to make it. 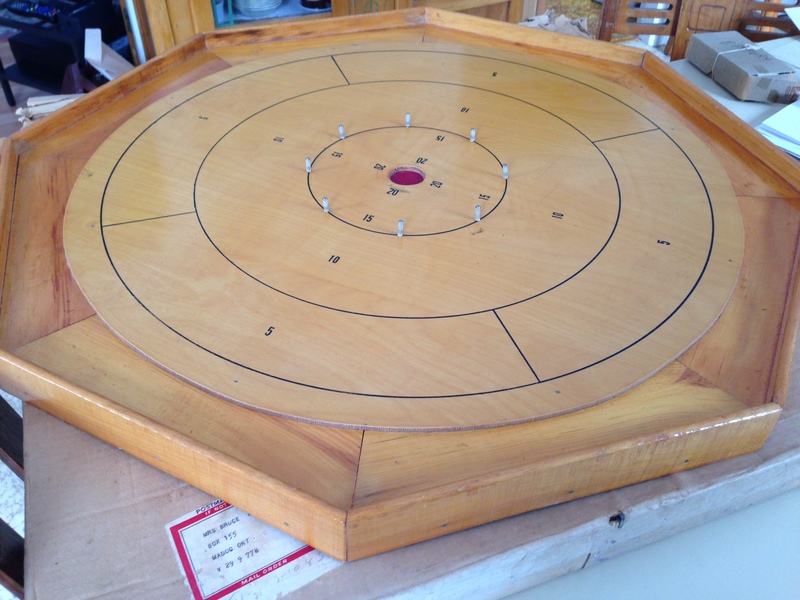 Even though Raymond and I are novices at crokinole, I’m delighted to have this beautiful vintage board. It’s made by the Bentley Sporting Goods Company of Niagara Falls, Ont. – which, according to the Mr. Crokinole site, manufactured the boards between 1946 and 1958 – and was purchased (we still have the labels on the box!) from none other than the T. Eaton Company. So off I went to Eldorado (it’s only a little more than five miles from Queensborough) last Friday night, despite being pretty tired from a long week at work. And what a time I had! Mainly I came away struck by two things: 1) what a terrible crokinole player I am; and 2) how very nice people were. Here (for the uninitiated) is what you do at a crokinole party – at least, if it’s a crokinole party in Eldorado. You sit down at one of the tables for four that have been set up, and the person across from you is your partner. You and he or she play with either the black wooden discs or the light-coloured ones. Your mission is to get as many of your team’s discs as possible in high-score positions (close to the centre) even as you knock off the other team’s discs. If they have discs on the board, you have to try to shoot them off. If they don’t, you can try to get your disc into the hole in the centre of the board; at Eldorado they call that a “button,” and it’s worth 20 points. After several rounds the game is over and you add up your scores, and the winning team moves clockwise to the next table, while the losing team stays put but one of the two members moves to a chair to the right or left – so you never play twice with the same partner. But speaking of good plays: many of the people I played with were extraordinary crokinolers! (Is that a word?) Able to hit two or three of their opponents’ discs with a single shot, strategically using the posts, or pins, that encircle the centre of the board to make brilliant ricochets. To be honest, I would rather have sat back and watched these great players do their thing (and maybe learned something from them) than been trying to make my own pitiful moves. You might think that these excellent players would have been irked at being stuck with a partner, or even a tablemate, as bad as I was. But you’d be utterly wrong. Every single person was so encouraging and nice. On the rare occasions when I actually managed to knock off an opponent’s disc, they’d cheer me on like it was a totally great play. (It was not, you can be sure.) Isabella had assured me that the event was not about how good a player you are, but about fun and fellowship. And that was exactly what it was. After the games were ended and the card tables folded up and put away, out came the lunch. (Everyone is asked to bring a contribution for it.) There were sandwiches – yes, the delicious church-basement kind that I wrote about here – and wonderful sweets, many of them homemade, and pickles and – of course – cheese. And coffee and tea to wash it down. And we sat around and chatted and I answered more kind questions about my family, and met some more old friends and new people, and was struck all over again at how nice everyone was and what a pleasant and easygoing evening it had been. As I walked out of the Eldorado hall into the darkness and quiet of a cold, clear night in the country, I thought about how much evenings like this matter in rural areas. When you live in the country, possibly not even within sight of your nearest neighbour, community events are, I think, more important than they are in the city. A lit-up building full of people, a warm welcome, stories to share and games to play, and a nice lunch at the end of it all – if that’s not a great way to brighten up a cold, dark night, then I don’t know what is. Sometimes it’s the oddest things that catch you off-guard about life in the country. 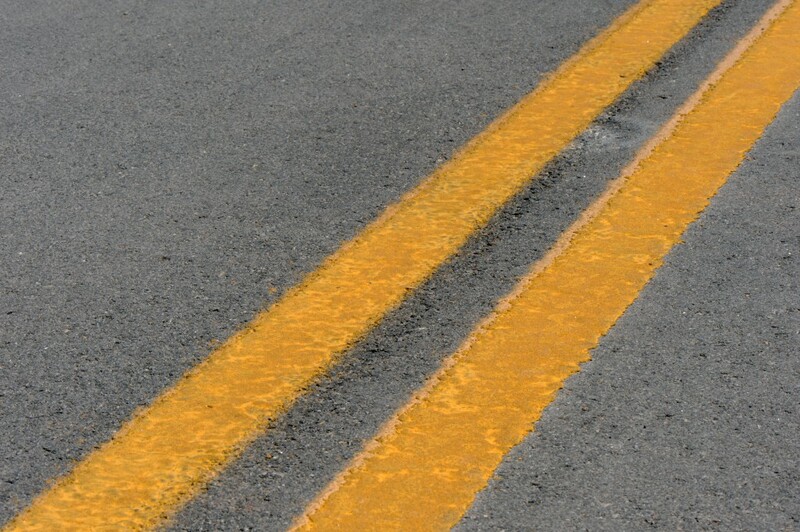 One thing that I have had trouble getting used to since our move to Queensborough is the frequency with which drivers on the local highways will pass under what I consider dangerous (not to mention illegal) circumstances: when there is a double yellow line in the middle of the road. People, nothing could be further from the truth. I am in fact a pretty speedy driver as a rule, and I’ve got some impressive speeding tickets in my (fortunately fairly distant) past to prove it. If anyone’s poking along in front of me, you can be sure I will pass if at all possible. But I would never risk passing on a double yellow line, and I still can’t quite believe my eyes when people around here do it. Just this afternoon, driving north on Highway 62 from my work in Belleville, a driver passed me (and I was doing above the speed limit) on a double line as we were going up a hill and were, in fact, alarmingly close to the crest over which an oncoming vehicle could very easily have been coming. And this same driver then proceeded to pass some other vehicles on a double yellow line.What gives? I have been driving for a lot of years, on many different kinds of roads, rural and urban, in several different countries. And never have I seen so much illegal passing as I have in the five months since I became a full-time Hastings County resident. Can anyone enlighten me as to why this happens?